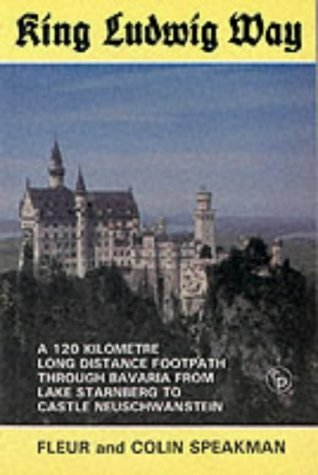 This title talks about 120 kilometre long-distance footpath through Bavaria from Lake Starnberg to Castle Neuschwanstein. The route is linked, emotionally if not historically, with that most enigmatic of Bavarian monarchs, Ludwig II, from the point where his body was found in Lake Starnberg in circumstances which remain one of the world's great unsolved mysteries, to the fairy-tale castle on the edge of the Alps which is his greatest memorial. Add to the ingredients countryside of rolling beauty, often dramatically impressive, and a series of monastic churches of great architectural splendour, then you really do have a long-distance footpath which has something special. This is basically a lowland walk. You scale few dizzy heights, no impressive mountain passes, and the going is, for the most part, easy, along farm roads and tracks, forest paths, through a couple of impressive wooded gorges, over low hills, into attractive villages. The King Ludwig Way isn't in any sense a challenge walk. It's a cultural experience and is likely to appeal to people who have a sense of history, who are happy to combine some excellent, non-strenuous walking with glorious architecture, beautiful scenery and a chance to see a lovely part of Germany often well away from the popular tourist haunts. Talks about 120 kilometre long-distance footpath through Bavaria from Lake Starnberg to Castle Neuschwanstein. The route is linked, emotionally if not historically, with that most enigmatic of Bavarian monarchs, Ludwig II, from the point where his body was found in Lake Starnberg to the fairy-tale castle on the edge of the Alps.